Corporate notebooks are a special category of notebooks, which differs much from consumer models. Because their design priorities are absolutely different from those for consumer models. These notebooks will be used as tools, they will be used often and much, users will take advantage of all their features. Besides, such notebooks must be very reliable both in terms of operating stability (low failure percentage to reduce downtimes) and longevity (long service life and predictable upgrades to newer models). 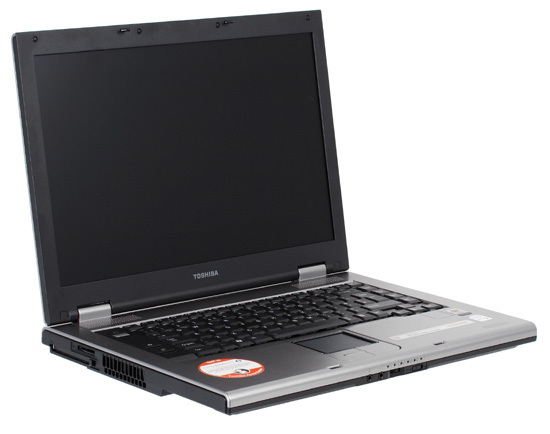 Toshiba Tecra A8 possesses all features of a corporate model. At the same time, Tecra A8 occupies a special place in company series, its concept differing radically from that of older models. The A8 introduces a number of innovations, so it stands out not only in Toshiba's corporate series, but in the market as well. For example, a wide screen is a very unusual feature for a corporate machine. By the way, Toshiba pins lots of hopes to Tecra A8, the company intends to win back its positions in the corporate market. Let's have a look at the model. In connection with the launch of this model, Toshiba conducted a large and comprehensive press conference. In particular, the company gave a detailed account of the new technologies used in the A8. You can read our report about the presentation here. You should really read it, because this article will not touch upon the aspects already revealed at the presentation. 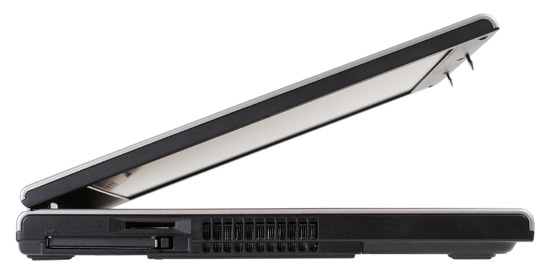 Tecra A8 is the latest notebook in the Tecra family that offers the highest reliability level - money back guaranteed. 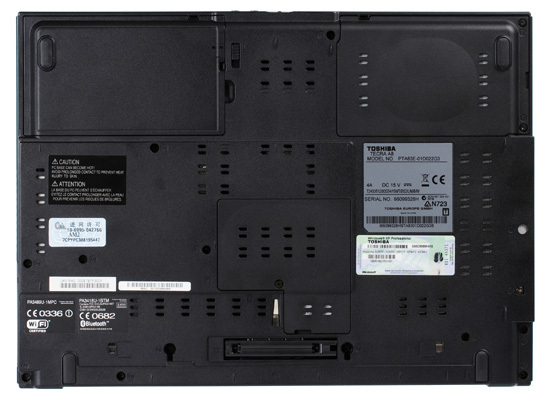 If Tecra A8 breaks during the first year and is repaired in one of Toshiba's authorized service center, you'll get your notebook repaired and full compensation of its price, if the product was registered for this campaign. Hmm, not much. Description of the money back campaign and practically nothing more. The deal ends on March 31 (after that you won't be able to register your notebook). Probably there will appear a more informative description afterwards. This page lists models from this family and provides its detailed description. You can go to descriptions of specific models, browse tech support options, etc. I like the web site. It's well structured, you can easily find a page you need. The Warranty section is well organized. Toshiba notebooks should be registered on the web site. A100 and similar products have a one-year warranty. The "Customer Care" section is also organized well, you can easily find what information you need. Warranty Three-year international warranty. Use Toshiba's offer to prolong the warranty and get additional aftersales service. Learn the details from your nearest authorized Toshiba retailers. The web page with specifications is available here. We tested a presale sample, so the actual bundle may differ from what we describe. * It means that you will have to use the adapter in places with "Soviet" sockets, this plug does not fit into our tee-joints either. The short cable does not allow to use sockets far from the notebook. We used the standard Windows profile for our tests - "Portable/Desktop". Display brightness was set to maximum. According to test results, capacity of the battery is 33165 mWh. The notebook performs very well in terms of battery life. First of all we should say that the keyboard layout differs much from the standard one used by Toshiba. Unfortunately, there are some problems. The keyboard has two major flaws - vertical Enter and short left Shift with the second "\" button to the right. I already mentioned inconveniences of this layout, especially to those who can type without looking at the keyboard. That's the main problem with the layout. We should also mention that Del and Ins keys are now placed in the top right corner of the keyboard instead of to the left of the cursor keys. Correspondingly, Windows buttons are arranged like in a standard keyboard. 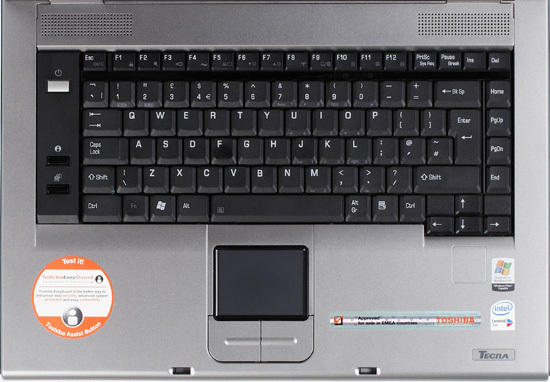 It makes this keyboard more convenient for users, who previously used notebooks from other manufacturers. But it's less convenient for those who already used old Toshiba notebooks. Speaking of advantages, the ctrl button is in the corner, so it's more convenient for touch typing. What concerns tactile feedback, you immediately notice that the keys are soft. The keyboard even produces an impression that its keys are loose. It does not click loudly either. At the same time I have an impression that it's well protected from accidental key presses. It's very easy to type on this keyboard, your fingers don't get tired. On the whole, it produces a nice impression, typing is convenient. But it should be said that the keyboard bends much in the center (this notebook was disassembled many times at presentations, so that may be the reason). But this is not much of a problem, because the keys are very soft. Main indicators are placed on the front panel of the notebook. So, very often you cannot see them. Mostly when the notebook stands on a desk in front of you and very often when you type. Manufacturers have started splitting battery and notebook on/off indicators to provide fuller information on system status. The front panel also houses a wireless antenna on/off switch (this switch is very convenient and moves easily) as well as a volume control dial. I was surprised that it's implemented as a jog dial (like in many products from Sony) instead of a dial. That is it's a rocking wheel that moves from the central position by 30°-40° both ways, instead of spinning the entire way around. And finally, there are two application keys under the power button, to the left of the keyboard. The first key, Toshiba Assist, starts a launcher, which accommodates a huge number of proprietary utilities to configure a system. You can also burn an optical disc with a system image, configure some hardware functions and system access passwords (Toshiba used to have a problem - the system allowed to specify passwords in any language, while BIOS naturally couldn't accept them. So the password got lost and the notebook refused to startup. As a result, people would go to service centers, because of password mismatches). The launcher seems to be rather convenient and handy. The second button switches the system to an external display. This function is useful for conducting presentations, when you connect and external projector. This feature is often used in corporate notebooks. It's a wide case - a new feature for a corporate model. Judging by the layout of ports, this notebook belongs to the group of desktop replacements. For example, the indicators, headphones and microphone jacks, and the volume control are placed on the front panel. Besides, speakers in this model are placed over the keyboard and face upward. By the way, I'd like to remind you that this notebook was presented in December. In particular, there were provided details on technologies used in this model, peculiarities of its case, and reliability tests, which among other things, were intended to ruggedize the case. But let's return to the case. Its materials are definitely up to the mark. I especially like the silvery keyboard panel - it looks great (from afar, you can even think that it's made of metal). It has a nice hue - something between grey and silver. Assemblage quality is almost perfect. There are some flaws, but this notebook was certainly disassembled many times. So I paid no attention to the fact that the display frame squeaks and is not secured well. By the way, the display lid itself is rather sturdy - I couldn't bend it. It bends a little in extreme conditions (if you turn it in different directions), but the lid is very tough, especially considering that it's a wide-screen model. Many users are interested whether you can carry an open notebook holding it by one corner. The case is sturdy, it's very convenient to hold the notebook by its sides. Nothing bends or squeaks. The left wrist pad does not bend. But the right one bends much in the center (near the Toshiba label). But the notebook is very heavy and wide, so you cannot carry it with one hand - it will wrest out of your hand. This fact persuades me that it's not quite a portable notebook. As we have already mentioned, the front panel houses headphones and microphone jacks, the volume control dial, and the wireless on/off switch. It also contains: SD card indicator, LAN indicator, PC status (green when the notebook is working and blinking orange when idle), battery status (battery mode / charging / discharged), HDD activity, wireless status). The right flank houses an optical drive and Kensington lock port. The left side - a large cooling vent (it hides a small but wide heatsink, together with a wide cooling vent they provide good ventilation), as well as the SD card reader and PCMCIA slot. Ergonomics of the notebook leaves a number of questions. I have an impression that engineers designed it for standing on a desk, its connectors replugged once a year, or constantly connected to a dock station, this issue being irrelevant. But a user must have at least one USB port within reach! The display is a wide 1280×800 panel, not mirror-like. The panel is manufactured by the TN-film technology. Subjective impressions from the panel are excellent. Firstly, backlight is rather bright, maximum brightness is on a high level. In addition, it increases contrast to provide comfortable operation under bright sunlight. Secondly, angles of view are very good for TN-film. You can watch movies without swimming colors, if you are careful. Thirdly, in my opinion, this resolution is a good balance. For example, symbols on the 1400×1050 (4x3) panel will be too small for me. This panel has no such problems. We should also note the audio system. Speakers are rather loud, although there is nothing special about them. The notebook comes with many utilities, both proprietary and third-party ones. We should note traditional Norton Internet Security (90-days trial), Sonic DLA, RecordNow. Besides, the bundle includes lots of Toshiba utilities. Sometimes they overlap (that is, for example, several utilities are responsible for the same interface). They are Bluetooth utilities (Toshiba), WiFi utilities (ConfigFree and others), as well as a number of special utilities, including Multiple-Level Password Utilities, FN Shortcut Keys, and HDD Shock Absorber. This model also has a new illustrative and convenient power saving utility. I have mixed feelings, to tell the truth. On one hand, the notebook has a number of strong points – keyboard, panel, sturdy case, etc. On the other hand, since a notebook needs no allowances, it has some serious drawbacks. For example, its ports are grouped very inconveniently, the notebook is very inconvenient to carry, etc. I agree that it probably does not match my style of usage. But the flagship of the corporate family must be universal and convenient, not just a desktop replacement. It's a notebook for corporate use and professional users. Toshiba representatives spoke that they did not want to limit themselves to corporate orders only. They wanted to retail these notebooks as well to win users who wanted to use professional devices, but had no access to corporate channels. At the same time, the professional segment – if this notebook is not transported very often or carried in a bag. I'd say that it's not designed for portability, it will be very inconvenient for this style of usage. Out of doubt, the A8 is a large step forward for Toshiba and for the market in general. Especially for the corporate market. But this step is not without problems. While these problems are pardonable for cheaper mainstream models, I expected more from such a product, which pretends to leadership in its class. Nevertheless, it's an excellent innovative notebook, which uses a number of unique technologies mentioned at the presentation. of Toshiba for the provided notebook.